If you live and work in the state of Louisiana, and have done so for a significant length of time, you may have been exposed to asbestos in your workplace. Some of the latest figures put the number of residents in the state of Louisiana that died from mesothelioma—a disease caused by asbestos exposure- at nearly 800 over the last 15 years. If this seems high, consider that Louisiana has this above-average death rate resulting from mesothelioma despite the fact there are no known asbestos deposits occurring in Louisiana. Geographically, the central and northern parishes in Louisiana have the highest rates of mesothelioma. The state of Louisiana has a long history with offshore oil drilling, oil refineries, shipbuilding, cement plants, power plants and agriculture. A significant amount of asbestos was used in offshore drilling rigs as well as in oil refineries, as a method of preventing and containing any possible fires which might erupt. Texaco, Shell Oil, Citgo and BP Amoco are among the oil companies which have placed their employees in harm’s way by exposing them to asbestos. Louisiana is also a naturally good location for ship construction and repairs, since it is a coastal state, so it follows unfortunately that this industry has been plagued with asbestos exposure. Avondale Shipyards had businesses in New Orleans, Baton Rouge, Algiers and Westwego. Higgins Industries, Bollinger Shipyard, Todd Shipyard, Avondale and others were known to expose workers to dangerous levels of asbestos. As far as cement plants go, a 1987 study done on Louisiana cement plants showed significantly elevated rates of cancer among these plant workers; many of the plants used amphibole asbestos or white chrysotile asbestos as primary ingredients in their cement mixes. While you might think those who work in the agricultural industry would be safe from asbestos exposure, in fact asbestos was used in harvesting machines and at agricultural mills. Since rice has been a staple of the state for over two centuries, the production of this crop resulted in asbestos exposure for many workers. Asbestos exposure cases have been filed against Abbeville Rice Mill, Louisiana State Rice Milling and Acadia Vermillion Rice Irrigation as well as other rice mills and companies. Power plants in every state, including Louisiana, typically contain significant amounts of asbestos, used to insulate against the electricity and heat caused by power generators. Shipyards across the state have left many workers exposed to deadly asbestos. 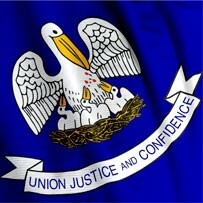 Asbestos exposure leading to mesothelioma has occurred across the state of Louisiana. As just one example, consider the capital city of Baton Rouge. Baton Rouge is both a major industrial center as well as an active shipping port—a center for salt, petroleum and natural gas processing. The city is filled to the brim with companies like the Standard Oil Company, ExxonMobil, Turner Industries, Kaiser Engineers and the Shaw Group (oil refineries, construction companies and aluminum plants) as well as chemical and polymer companies like Dow, DuPont, Borden and Copolymer. In fact, the city of Baton Rouge has a long history of commercial construction and heavy industry during the period when asbestos materials were widely used, as do many other cities in Louisiana. Many people were surprised and dismayed to hear that in March of this year, asbestos was found at a New Orleans courthouse. Samples from the courthouse were analyzed in 2016, and it was found that 40 percent of those samples, taken from the ground and first floors, tested positive for asbestos. When asbestos is disturbed or damaged, the fibers can be released into the air, then inhaled by those in the surrounding areas. Workers at these and other companies who used asbestos may have developed mesothelioma—a deadly cancer caused by asbestos exposure, which affects the lining of the lungs, abdomen and the heart. To compound matters, Louisiana citizens were also faced with the thousands of older homes destroyed by Hurricane Katrina, many of which had asbestos in the roofs, floors and/or walls. If you or a loved one have been diagnosed with mesothelioma as a result of asbestos exposure, it is important that you speak to a knowledgeable mesothelioma attorney as soon as possible. Your future is truly at stake, so do not wait to speak to an experienced asbestos attorney.